When it comes to the Old School Renaissance, the gamer has plenty of retroclones to choose from, depending upon his preferred version of Dungeons & Dragons. Of course, if you really wanted to play in the Old School style, then what you want is a retroclone which draws from Original Dungeons & Dragons and for that there is no finer starting point than Swords & Wizardry. Originally published in 2008, Swords & Wizardry has proved to be a popular choice of retroclone and despite being a fantasy roleplaying game, it has actually formed the basis of some Science Fiction roleplaying games, in particular White Star: White Box Science Fiction Roleplaying from Barrel Rider Games and its Pulp Sci-Fi offshoot, Dare the Stars! The Future as it Once Was from Wild Boar Games, LLC. In the decade since, Swords & Wizardry has appeared in various versions, most notably Swords & Wizardry - Complete Rulebook and Swords & Wizardry Light. As its title suggests, the former contains everything you need to play and more, but the latter is a free-to-download and play version that covers the four core Classes of Dungeons & Dragons and First to Third Levels of play. Between the two and released in late 2017, is the latest iteration of the roleplaying game, Swords & Wizardry Continual Light. The opening sentence of the introduction to Swords & Wizardry Continual Light is as follows: “You remember, don’t you? The sounds of battle heard through the clatter of dice? The shuffling of character sheets? The war stories shared with fellow campaigners?” This perfectly explains what Swords & Wizardry Continual Light is designed as. This is both as an introductory roleplaying game and not as an introductory roleplaying game. It is an introductory roleplaying game for gamers who have roleplayed before, either returning to the hobby after a while away and wanting to play a fantasy roleplaying game a la Dungeons & Dragons once again or wanting to try an Old School Renaissance retroclone after playing other roleplaying games. It is not an introductory roleplaying game in that its rules are radically streamlined for ease of play rather than ease of learning, so there is no explanation of what roleplaying is or how the game is played. Characters in Swords & Wizardry Continual Light have the usual attributes—Strength, Dexterity, Constitution, Intelligence, Wisdom, and Charisma. A bonus of +1 is awarded if one of the attributes is fifteen or more, which has various effects depending upon the attribute. So yes, the +1 bonus for Strength applies to a Fighter’s attack and damage rolls, but for a Magic-User, a +1 bonus for Intelligence acts as a penalty to anyone who has to save against his spells, whilst for Charisma, it also grants an NPC, a Torchbearer, who will join the adventurer on his explorations and expeditions. There are four Races—Dwarf, Elf, Halfling, and Human, and four Classes—Fighter, Cleric, Magic-User, and Thief. The three non-Human Races provide various bonuses, but are limited in their choice of available Classes. The Classes work as well as you would expect, granting Class abilities, a Saving Throw, a Base Hit Bonus, and a Hit Dice, but there are differences. So a Fighter is good at fighting, a Cleric can cast holy spells and turn undead, and so on. All Classes presented in Swords & Wizardry Continual Light are given a choice of Gear Sets in terms of weapons and armour, whilst all characters get to pick from a choice of Adventuring Packs which provides their starting equipment. The first difference though, is the fact that every character’s Hit Points are rolled on a six-sided die per Level rather than on different polyhedral dice per Class as in other Dungeons & Dragons-style roleplaying games. Similarly, the damage rolls for various weapons are rolled on six-sided dice rather than on polyhedral dice. The second difference is that each character only has the single Saving Throw, which of course, improves as the character acquires Levels. The rate of improvement varies between Classes. The other difference pertains to the Thief Class, which like every other treatment of the Class, has various burglary-related skills. These are rated between one and six, rather than on a percentile scale as in other Dungeons & Dragons type roleplaying games. To create a character, a player rolls three six-sided for each attribute and keeps the results. He selects a Race, a Class, spells if the Class allows spells to be cast, and then a Gear Set and a Adventuring Pack. The most time consuming part of this process is actually writing it all down, but the information is slight enough that it could be noted down on an index card. Perhaps the biggest difference in Swords & Wizardry Continual Light is how experience and the acquisition of Levels is handled. It foregoes Experience Points and simply awards a character a new Level after he has played through a set number of adventures. This is two to go from First to Second Level, then five to go from Third to Fourth Level, and so on all the way up to Seventh Level, the maximum Level possible in Swords & Wizardry Continual Light. This is pleasingly simple and it nicely supports a couple of options also given. These include eight optional Classes—Bards, Assassins, Druids, Monks, Necromancers, Paladins, Rangers, and Swashbucklers—which are variants of the four core Classes. All eight are quite powerful in comparison to those four core Classes, so Swords & Wizardry Continual Light balances this in a simple way. The character of an optional Class has to complete an extra adventure to acquire a new Level in comparison to the four core Classes, so three instead of two to go from First to Second Level. Further, the rules provide an option for playing beyond Seventh Level, allowing players to purchase Perks like an extra Hit Point, an additional spell slot, or a reduction a character’s Saving Throw, using credits they accrue for completing adventures. One last option gives rules for balancing playing a Human character rather than a character of another Race and allowing a Cleric to have spells at First Level. In the main, the rest of the book consists of a series of short sections. So equipment, spells—four or five spells for each Level up to Third Level for the Cleic and the Magic-User Classes, combat and running the game, and treasure are covered in just a couple of pages each. This is done by stripping the content back to its bare essentials, so that spell and treasure descriptions and effects are expressed on no more than a couple of lines. Monster details and descriptions understandably need a little more space, but not much, but the sheer number of them means that almost five pages are devoted to them. Again, their details are stripped down, but the combination of stats and description rarely amounts to more than four lines. Rounding out Swords & Wizardry Continual Light is a glossary and a guide to converting Swords & Wizardry Complete to Swords & Wizardry Continual Light. All this runs to just twenty pages, including the Open Gaming Licence. Which begs the question, what is missing? Obviously, there is no introduction to roleplaying, no example of character generation, no example of play, and so on, but then arguably Swords & Wizardry Continual Light does not need them because it is not aimed at an audience which needs that sort of introductory content. What Swords & Wizardry Continual Light very much lacks is an adventure. Without that, it feels like a complete set of mechanics, but not a complete package and an adventure would have rounded the Swords & Wizardry Continual Light out. It is not even as there is not space available—there are a few more blank pages which could have been filled with an adventure. Physically, Swords & Wizardry Continual Light is a bit hit and miss. The layout is at best serviceable and readable, but that is in the main due to the stripped down nature of the text, organised as it is into almost bullet points. One issue is that the character sheet is plain ugly and artless. Another is with the art. The book’s cover is great, but it does not match the internal illustrations, especially in terms of tone. It is great and it is heroic, but the internal illustrations depict down at heel, desperate adventurers all but muddling through in grim, dangerous situations. Some of the artwork quality is poor, but the worst problem is that its size varies too much and impinges upon the layout. This really needed to be more consistently handled. Lastly, it feels as if it should be presented as an A5, digest-sized book rather than the A4 size it is. Bar the adventure, there is no denying that Swords & Wizardry Continual Light gives you everything necessary to play and presents it in as to the point and as accessible a fashion as possible. As a printed booklet though, it feels a little more expensive than other games of its ilk, especially given the lack of adventure. 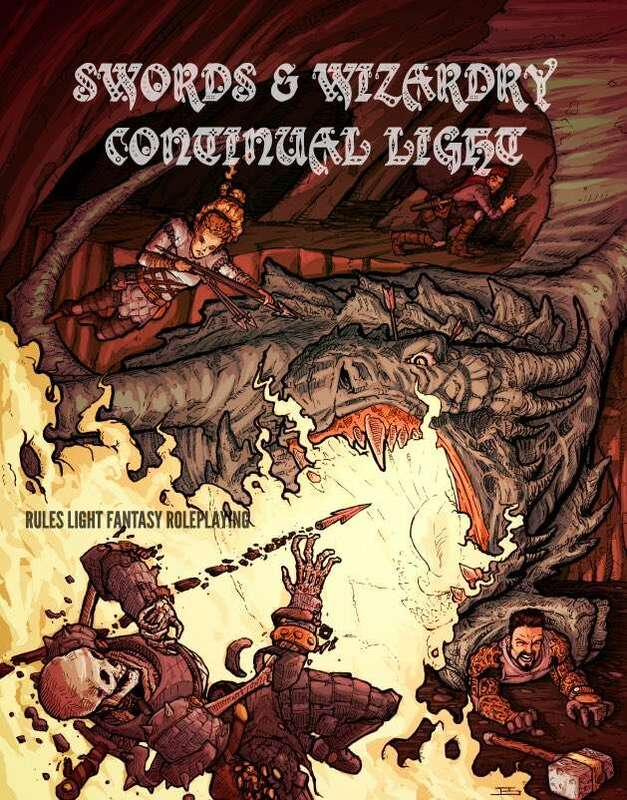 That said, the PDF version of Swords & Wizardry Continual Light is inexpensive and the available adventures are just as inexpensive, so that the Dungeon Master can get playing quickly and easily without being too heavy on the wallet. It also feels like it should be in a box with dice and adventures and character sheets, essentially a ‘White Box’ version of Swords & Wizardry Continual Light. 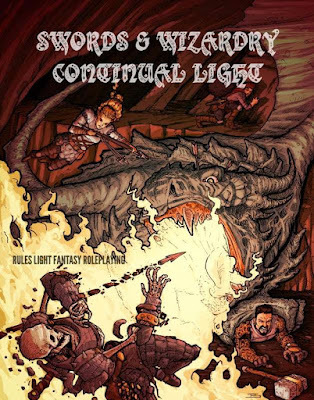 Published by Triumvirate Tavern Publishing, Swords & Wizardry Continual Light is overall, an impressively simple and straightforward retroclone. It may not do anything particularly original, but what it does, it does to the point and it does in a pleasingly familiar fashion. Swords & Wizardry Continual Light is stripped down, sparse Dungeons & Dragon-style gaming, perfect for making the switch to the Old School Renaissance or coming back to the hobby.